25 fun facts about Germany you should know before you go. Ah, Germany – the land of limitless road trips, beer, sausages and Oktoberfest. Germany lures you with castles in forests, valleys of vineyards and cosy villages. But there are some things that the guidebooks don’t tell you that can make your trip a thousand times better, so, here are some fun facts about Germany to consider when making plans to visit. When my mother and I decided on taking a budget summer trip together (what was I thinking?! ), we knew we had to meet in the middle. She would fly down from St. Petersburg, Russia, and I would leave my beloved cats with my boyfriend and travel down from Amsterdam to the closest city in Germany. So, when Mom spotted the Ryanair tickets to Dusseldorf, she pounced. The deal was sealed for our 10-day adventure through Germany’s North-Rhine Westfalia. The journey brought about many epiphanies, one being that we tried to bite off more than we could chew and crammed too much into what originally seemed like a long holiday. The one thing we both learnt from the trip was that we would have to return to explore all the parts of Germany we missed. As nerve-wracking as travelling with my mother was (was there any doubt on that score? ), Germany turned out to be amazing. Cash is in wide circulation in Germany, especially compared to The Netherlands where I live. You’ve got to have some small change prepared and be ready for situations that don’t allow for card payments. As soon as I stepped on the Deutsche Bahn train in Amsterdam, I was told that my iDEAL debit card wouldn’t work in the restaurant compartment. Be prepared to alternate between payment methods and have a bit of money in cash, on a credit card and debit just in case. Before visiting Germany, I always thought of it as an orderly place where trains were precise and the announced arrival time was always correct. Well, Deutsche Bahn didn’t get that memo. The train troubles started as soon as I crossed the border: we were dropped off in the middle of our trip at some godforsaken station and told to take a detour via a different train to get to Dusseldorf because they were doing road maintenance that weekend. At least Deutsche Bahn was consistent with their company policy. During our 10-day trip around Germany, I experienced more delays than I could count. The worst thing, however, is the Deutsche Bahn app is not updated quickly enough to be useful and most of the time, the information is outdated, which means the departure platform can change at the last minute and the app will still be minutes behind. So my advice to you is to get mobile data, research several backup options for connections and take several deep breathes. It’s a precious exercise in accepting the things you cannot change. Depending on your German itinerary you may end up moving between different zones and regions which means, you guessed it, different public transport companies. Deutsche Bahn, VRR, VRS, WT… It got confusing really quickly. Aside from the companies, you will also have to deal with different trains like U-Bahn, S-Bahn, Schwebebahn, bus lines and lots of others. Suffice to say your best planner friends are going to be the DB app and Google Maps, to plan a route that works, and, of course, a strong beverage to keep you sane. Winter is a scenic time to visit Germany. it’s a fact German winters can be cold (below zero) but it’s a great time to rug up and visit Christmas markets. Europe, in general, is not used to having hot weather in all its breathtaking glory. However, the historical German cities may well be competing for the title of “Worst Place To Be” when it comes to summer vacations during a heatwave. The heat is impossible when combined with finer cultural pursuits as museums are like ovens and exploring the rich history of German cities will be the farthest thing from your mind. Without air-conditioning, you will be lapping up water like a dog, chasing the slight relief that a shadow offers and gratefully paying a premium for ice cream only have it melt faster than you can eat it. On the plus side, a waiter might take pity on you and fetch unlimited carafes of tap water. Bless you, young man, you’ve earned your tip! One fact about Germany to take into account is that the country is much larger than you might think. This might sound weird coming from a Russian! It is a universally acknowledged truth that when one is on vacation, one is bound to underestimate the amount of time required for pleasant exploration. What I’m saying is, add at least an hour to all your calculations. Somehow, I always think I’ll only need an hour in a museum and discovering that I could spend a whole day in it just drives me to tears of bitter disappointment. It’s only too easy to underestimate the time it takes to travel across Germany and most people tend to overload their itineraries. Europe is small after all, right? Believe me when I say it is impossible to squeeze Burg Eltz and the Circle Bridge into a three-day highlights tour and come out of it alive. Pick one area and explore the hell out of it. Neuschwanstein Castle is a fairytale castle and one of Germany’s landmarks but a little-known fact about Germany is there are castles everywhere. You might find a castle on your next-door neighbour’s land, for example. This little gem in the suburban area of Bonn would have gone completely unnoticed but for our German host’s tip. Sure, these little blasts from the past are random but the fact that one day you might discover a castle while walking over your neighbour’s dried-out moat to ask for a cup of sugar is super cool! And in case the house opposite your AirBnB doesn’t look like a Bavarian castle, you can always make a trip to the famous Burg Neuschwanstein or the lesser known Schloss Burg Solingen. Abandon hope all ye who enter Germany: ye shall not get any receipts for ye tax deductions. German waiters are a rare breed who can calculate very quickly and present you with whatever total they’ve worked out in their heads. You just have to pay in cash and off you go. This weird custom is especially true of biergartens, Germany’s best spots to hang-out. Some operate in the form of the self-service cafeteria where you select your food from a buffet and then head over to check out. Drinks are sold separately at the bar or a designated window, depending on where you are. So, you’ll need to figure out who you should be paying for drinks and food. Oh, and don’t forget that there’s usually a deposit on the glassware, so expect to pay extra in advance and remember to get your deposit back when you turn in your dirty glasses. I noticed that in Dusseldorf, drinking beer while standing is just a regular occurrence. Many of the pubs in the Old Town have standing tables next to the street where visitors can relax and people watch. The space inside the pubs is filled with regular tables for those who wish to eat. By the way, drinking Alt beer is one of the best things to do in Dusseldorf. This type of beer is unique and comes from the city’s best breweries! One fun fact about Germany is beer flows freely and you’ll end up drinking more than you usually do. It is very rare for locals to restrict themselves to a single glass of beer. Waiters will make the rounds to refill beer glasses automatically unless you make it a point to signal that you don’t want any more. The only way to do that is to cover the top of your glass with the coaster. How do they keep track of how many glasses a person had? The crayon markings you see on the coasters are the number of glasses of you drank. I guess that explains why an average German drinks 104.2 litres of beer per year, huh? Did you ever connect with a local who knew more about your culture than you about theirs? Don’t be surprised when your German hosts reveal themselves to be knowledgeable about your pop culture, literature classics or political situation. It’s a lovely situation to be in until you feel obliged to keep pace and mention a favourite German singer, writer or movie. Tempted to go for the cheapest flights to Dusseldorf? My guess is, you will be flying Ryanair. Little did you know that the Dusseldorf Weeze airport is 40 miles (60 km) away from the city. It is kind of funny in hindsight that as I struggled with finding a train connection to Dusseldorf Hbf after being offloaded in the countryside. My mom was stranded in a random airport for an extra hour because none of the information matched her research. Do your homework to make sure your connections work. Otherwise, if you’re unlucky, you might spend extra money on travel costs that you didn’t anticipate and also lose precious vacation time. During my travels, I noticed that the residential houses in Germany often had a strange looking sticker on their doorposts. At first, I thought it was a weird mathematical formula but discovered it was a blessing. What initially reminded me of a Jewish mezuzah turned out to be a Christmas blessing brought to these homes by carolling children. One of the formula’s elements is the year the last time the house owners welcomed the children. While I consider this to be pretty useless knowledge, sometimes you just gotta have an answer for a question that’s bugging you. So when you see those during your trip, wonder no more! It’s a fact that the views in Germany will take your breath away. Hop on a train in Koblenz and head to Traben-Trarbach or Cochem. The route will take you along the Moselle River to a region filled with vineyards decorating the sloping hills with green patchworks. It takes you past castle ruins, quirky towns and ferries carrying passengers to wineries. The river snakes past the Cochem Castle as the valley landscape slowly changes. You will be glued to the window for the entire trip. Upon arrival, you will be rewarded with idyllic medieval villages sprawled beneath ancient castles that will welcome you into their halls. It’s an ideal vacation in Germany. Germany brings you closer to nature but sometimes too close. Perhaps, the flavour of German beer is to be blamed for the abundance of thirsty wasps. Be prepared for them to venture outside of well-tended gardens to stalk the biergartens in Germany. As long as you cover your drink with a coaster, all you have to do is stare down the wasps if you have enough nerve. Do you know your bratwurst from your bockwurst? 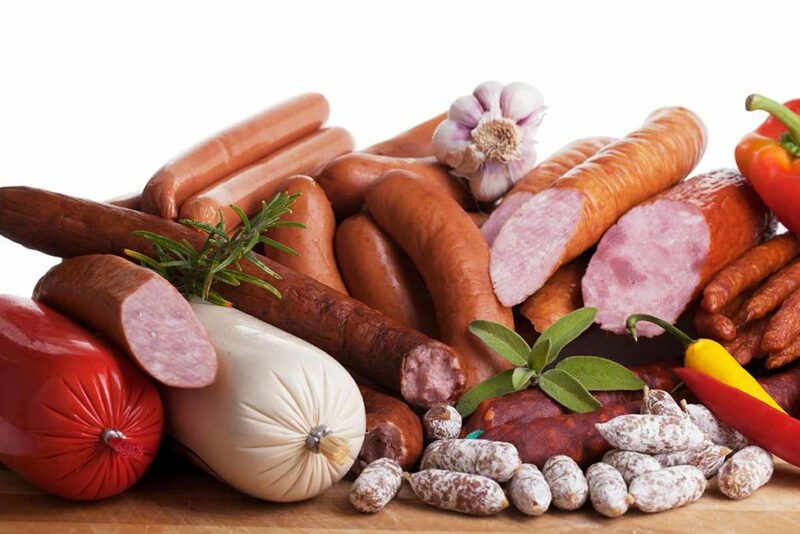 One of the indisputable facts about Germany is there are too many types of sausages to keep track of. It’s quite common to choose from chalkboard menus in biergartens but unless you know your Bratwurst from your Bockwurst, you’ll be in for a surprise. Bratwurst: this type of sausage is made out of pork or veal. Blutwurst: this is blood sausage, also known as blood pudding in the UK. Bockwurst: is a long white sausage resembling a hot dog. It is made out of pork and veal as well. Currywurst: steamed, then fried pork sausage cut into slices. Bregenwurst: common in Lower Saxony, this sausage is made from pork and pig or cattle brain. Knackwurst: this sausage is seasoned with garlic and made from a combination of ground beef and pork. Leberwurst: this is liver sausage popular throughout Europe. Here’s a little-known fact about Germany: Farina produced the original 4711 Eau de Cologne. One of the things to do in Cologne is to purchase original Eau de Cologne as a souvenir, however, you’ll discover that the story of the invention of the classic perfume is a sensitive topic. In Cologne, there are promotions for 4711 cologne everywhere but the original, in fact, was created by the Farina perfume house which is now a Fragrance Museum. The Farina perfume was invented in 1709 and was used by royalty all over the world ever since, including Madame du Barry, Tsar Alexander I and Napoleon Bonaparte. Napoleon used around 12 cologne bottles a day. Can you imagine the bill? Rumour is, he actually drank the stuff and practically bathed in it. Meanwhile, another company made a duplicate 4711 and took advantage of a loop in German trademark law. The quality and recipe behind Farina’s staple scent haven’t changed since it was originally invented but the imitation cologne’s aroma is of lesser quality and has nothing in common with the original. It is advertised, however, as the “real Eau de Cologne”. I love the Farina cologne and will order more once my stock runs out. You also get a list of famous Farina users with your purchase, which impressed me considerably. To think that I’m using the same scent as royalty! Well, I never! Did you know that Germany has the best Haribo stores? Is there any better road trip snack than a colourful gummy bear? Even if visiting a Haribo store wasn’t on your Germany checklist, the sheer variety of candy in stores will win you over. Get ready for limited editions, unique tastes, and more sugar than you bargained for! And, of course, if you’re in Bonn or thereabouts, stop by the flagship stores! What was it like for the losing side? What did life look like for the citizens? Visiting the Federal Republic of Germany museum is one of the best things to do in Bonn. The historical evidence in the FRG Museum will take you on an unforgettable journey from the end of the war to modern Germany. The exhibition lets you experience the flow of time and compile an image of what life was like out of newspaper articles, daily use products, food and technology. The consequences of the war stretched through the decades bringing the country to where it currently is. Those are things not taught in schools. The beauty of the exhibit is that you follow Germany’s development through the years decade by decade to modern times. Travel zones is a familiar concept throughout Europe, however, it’s pretty hard to tell whether your ticket will cover you if you venture outside of the city. You also need to remember that sometimes you’re not just travelling from city to city but from one land to another. So if you want to be as frugal as possible, research the routes in advance otherwise, just throw money at the machine and get unlimited travel within certain zones and cry when you see your bank statement. Nuremberg in Germany is just one of the many beautiful cities and towns. One of the facts about Germany is that most places have an old town with colourful buildings. Fresh food from the market? Pastry shops and cozy cafes? Double check. You’ll never get tired of seeing these again and again. Munich in Germany is just one of the many beautiful cities. It’s a fact that German cities are some of the most beautiful in Europe. The Old Town is a part of every German city centre and is a great idea for a drinking game. Drink every time you spot a fountain! An old clock! The Rathaus! In all seriousness, there is plenty of charm in the cobblestone streets and the historical buildings. You will always find a monument or a fountain, the Town Hall and a food market full of fresh fruit and vegetables. Does the photo above make you want to book a trip to Germany? Here are some fantastic things to do in Munich. Check out these fun facts about Germany. You probably already know the dirndl, the national costume worn in Austria, Switzerland, Bavaria and other German lands. It’s a beautiful garment often worn during special occasions or at a beer festival. But what if you’re not visiting Germany during Oktoberfest? Who cares! Once you set foot in a German shopping mall, you’ll be dazzled by the array of dirndl of all lengths and colours. Even if you try your best to resist, you will find it difficult to escape without leaving the store with a full outfit and shoes to match. The cost of an outfit can put a big dent in your budget. Dirndl is an element of pride and many Germans splurge on the purchase which means buying a full outfit can easily cost 200 EUR at the least. But hey, at least try out a dozen of them before you head for the sale pile. Ah, the days when I used to think there was only one kind of pretzel, or as the Germans call it, brezel. You know, the one with salt? Well, my trip quickly proved how naive I was. I quickly discovered the cheese pretzel (käsebrezel), the butter pretzel, the Oktoberfest pretzel (wiesnbrezn), the New Year pretzel (neujahrsbrezeln) and the sweet pretzel (puddingbrezeln). The butter pretzels are so good I could jump on a train just to eat one right now. Germany is so beautiful and the landscape is gorgeous, it has a rich history and the food is fabulous. Whether you’re going to feel the “I’d better come back and do it again” or “I haven’t seen nearly enough and I want more”, you will return longing for southern Mosel wine, ordering food without any idea of what you’re going to get and enjoying the thrill of taking the road with the view. Lesia Joukova is an Amsterdam-based travel blogger focusing on cultural getaways throughout Europe. On her blog, Dutch Wannabe she helps readers discover new travel destinations and craft unique itineraries with just the right amount of culture, history and fun.